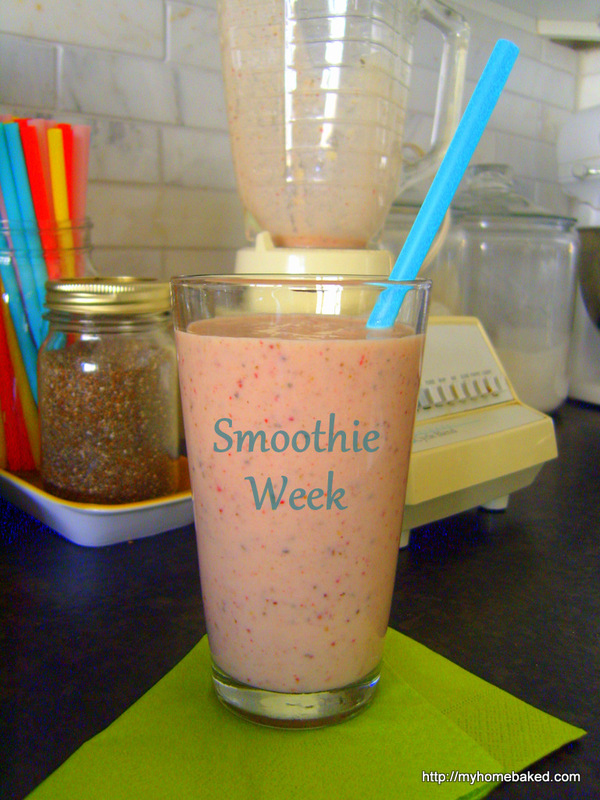 I declared last week Smoothie Week. If you’re going to stay home for spring break, you need to inject a little excitement into the usual proceedings. Without the need to get everyone out the door early in the morning, I decided it would be a good time to bust out the blender and experiment with some new smoothie combinations. Why smoothies? 1) They taste good. 2) They’re a sneaky vehicle for getting more fruits and veggies into all of us. 3) Depending on the ingredients, they can help prevent annoying tummy complaints that some of us have been suffering from. 4) A smoothie is also a good way to get some calories into Miss Seven, a reluctant breakfast eater. I did a little bit of googling to find out what ingredients to have on hand. I decided to stock bananas, frozen berries, baby spinach, plain yogurt, chia seeds, milk and orange juice. I also created a little smoothie station on the counter: the blender, the jar of chia seeds, and a jar of colorful straws. I sliced up the bananas (I like to buy the overripe bananas that are marked down) and stored them in a container in the freezer. The kids really got into the smoothie spirit. Every morning they would ask what kind of smoothie we were having. The verdict? I have had far fewer nights where my stomach has felt out of sorts. We’ve all had extra servings of fruit and vegetables, and we’re all getting a serving of yogurt every day. The kids didn’t seem to need a mid-morning snack. And they all asked if we could still have smoothies, even though Smoothie Week is officially over. And so we are. Those sound delicious!! My daughter and I are totally into smoothies these days, will have to give your banana cream pie one a try 🙂 That’s awesome that the kids liked the green one! I just bought some chia seeds…what is the texture like in smoothies? Crunchy? We found the Banana Cream Pie recipe in a magazine at the pediatrician’s office. 🙂 The chia seeds are a tiny bit crunchy at first, but they absorb liquid pretty quickly and become gel-like if you let the smoothie sit for a bit. They seem smaller than flax seeds and haven’t seemed to bother any of us. I put about a Tbsp. in the blender jar. We love smoothies. Do you use a specific amount of each item or does it vary each time? Would you use ground flax seed? I just eyeball it, but I taste and adjust if necessary. Sure, I’d use ground flax seed if I had it around. They only carry whole flax seed at my usual groceries, so I haven’t bought any. I read that chia is easier to digest, and I found it in the store, so that’s what I’m using at the moment.